The Messenger of Allah (may Allah bless him and grant him peace) said: “By the One in whose hand is the soul of Muhammad the believer is like a bee which eats that which is pure and wholesome and lays that which is pure and wholesome. When it lands on something it does not break or ruin it.” The bee only eats from flowers which are tayyib (pure and wholesome). It is not attracted to repulsive things, unlike some other insects. Likewise the believer only eats that which is pure and wholesome. 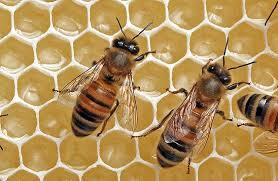 The bee lays or excretes honey which is also tayyib. Likewise only that which is good and wholesome comes forth from the believer, whether it be his words, his intentions or his actions. The bee is light and nimble and does not break the flowers upon which it lands, nor does it ruin them. Likewise the believer is gentle in his dealings with the creation and does not harm or ruin any human or animal or plant.